In Part 4 of this blog series, I briefly discussed how to describe and categorise hazards and hazardous events, as wells how to amend the risk matrix using the analysis (described in the Guidance document and, during this blog series – Blog 1, Blog 2, Blog 3, Blog 4). To take a few steps back, it is useful to provide an overview of the Water Safety Planning application in the Flood and Drought Portal. 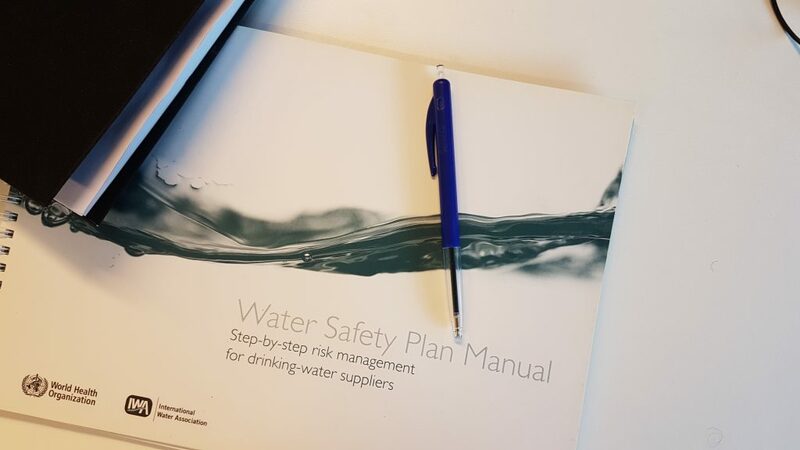 Water Safety Planning is recognised by the World Health Organization (WHO) and the International Water Association (IWA) as a systematic framework to manage risks by considering the impact of climate variability and change from catchment to tap. 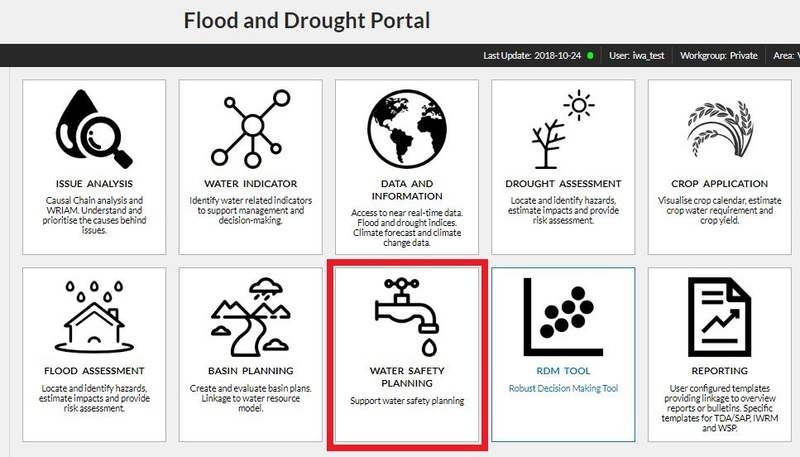 The Flood and Drought Portal provides users with access to a water safety planning tool to help document their WSP process and consider climate related risks to the water supply system. 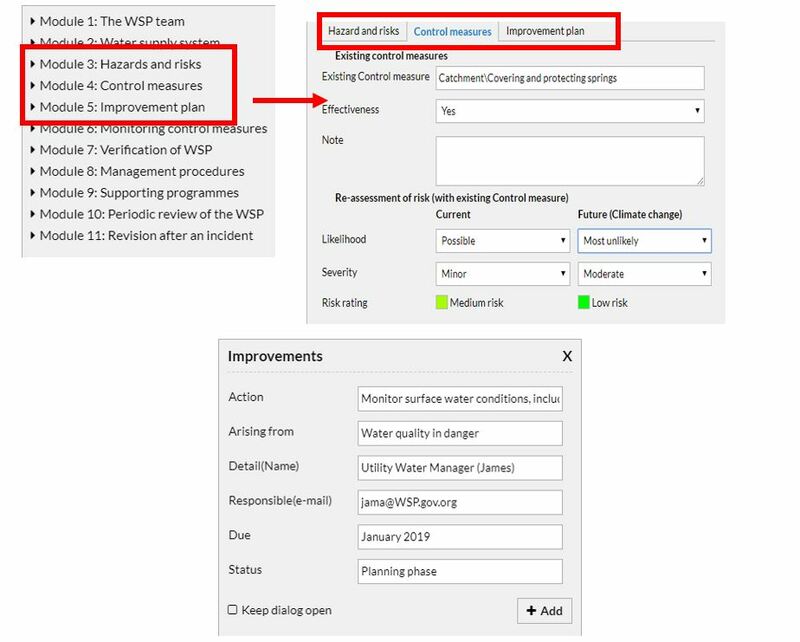 In this tool all the relevant information for each module can be captured and, a climate resilient WSP which can be developed (Figure 1 and Figure 2). When selecting any of the modules the user will be required to add the relevant information. 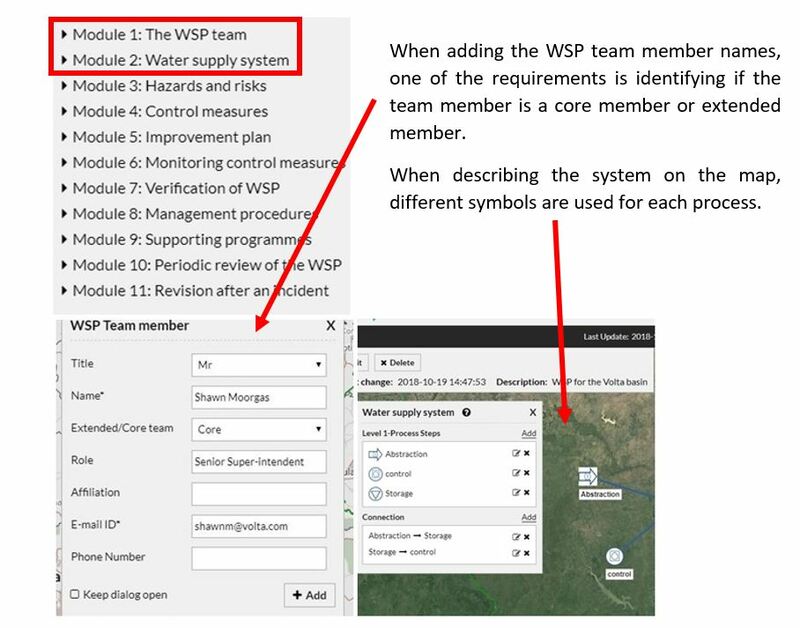 Selecting module 1 requires the user to add the WSP team information, and Module 2 requires users to describe their system on the map (Figure 3). When adding the different hazards and hazardous events, users can add the current and future likelihood and severity for their identified hazards and hazardous events (future likelihood and severity determined from the analysis presented the Guidance Document). An important aspect of this step is adding the effects of climate change for a hazard and hazardous event.  This will indicate to the user if conditions will change under the influence of climate change. The control measures and their effectiveness for each hazard and hazardous event can be added, and changed if it is not effective under the effects of climate change (Figure 4). 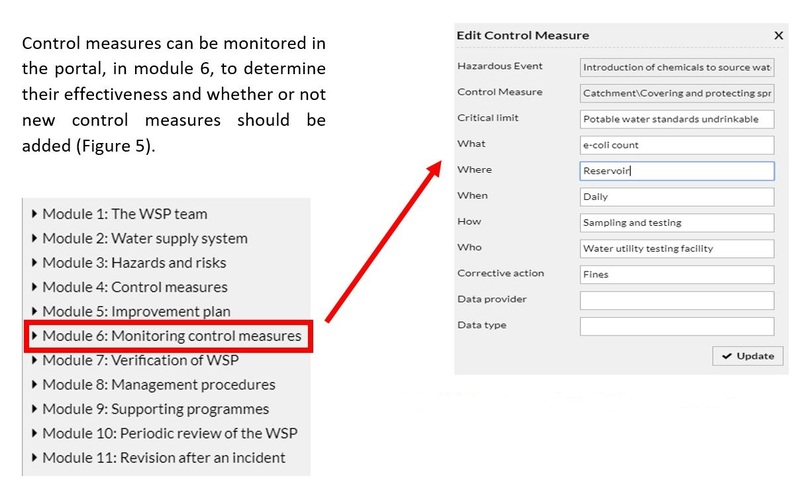 Module 7 in the Portal requires user to upload their own compliance monitoring reports, internal and external auditing reports, and customer satisfaction surveys to verify the effectiveness of the WSP (Figure 6). Figure 6: Module 7 requires documents to be added to the portal. The management procedures in the Portal for module 8 need to be uploaded (Figure 7). The supporting programmes should be uploaded to the portal for module 9 (Figure 8). 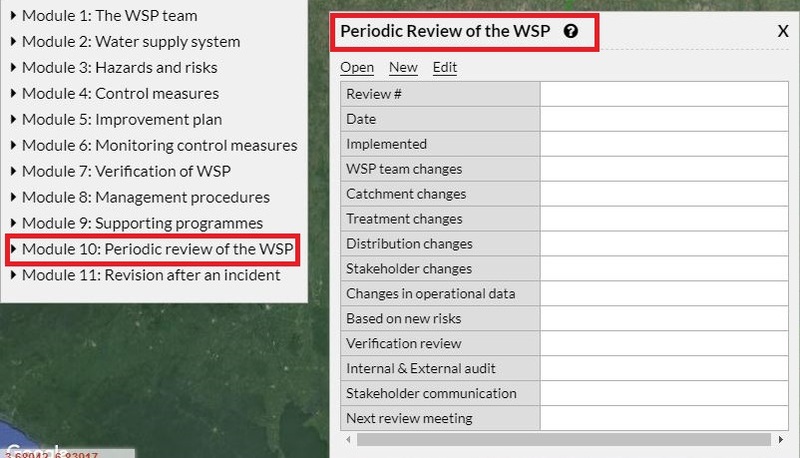 Module 10 allows users to update their WSP, and include the changes made to the system (Figure 9). 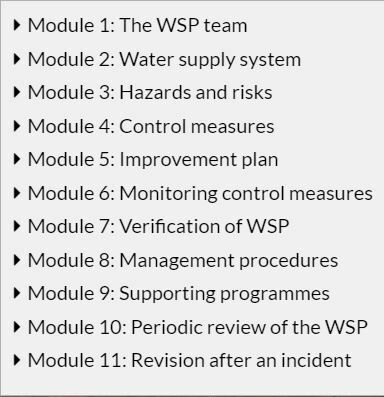 Module 11 allows users to revise their WSP after an incident has occurred. Information such as the hazard, action and emergency consequences are required (Figure 10). Over the last few months, I have briefly introduced the “Data and Information” tool within the Flood and Drought Portal, as well briefly described a methodology to assist water utilities with incorporating the effects of climate change on hazards and hazardous events into their respective WSP’s. The main purpose for this is so that water utilities are aware of the potential effects climate change may have on their water utility.  The full methodology is presented in a Guidance Document. The Guidance Document suggests that the methodology be applied using the selected datasets for both short term and long term. The Guidance Document also describes how this information should be incorporated into the WSP using the Flood and Drought Portal. The Guidance document will be made available on the project website and though the Flood and Drought Portal.